Private practice limited to Orthodontics, 137 Benedict Ave., Norwalk, OH 44857. Graduate student in Orthodontics, Indiana University, School of Dentistry. Program Director of Oral and Maxillofacial Radiology, University of Connecticut, School of Dental Medicine, Farmington, Connecticut. Objective: The objective of this study was to evaluate the influence of different orthodontic brackets on assessment of alveolar bone density. Materials and Methods: A sample of 10 fully dentate dry skulls was used. The skulls were bonded with metal, ceramic with metal slot and pure ceramic brackets. Large (0.4 millimeter) and small (0.2 millimeter) voxel CBCT scans were obtained for dry skulls with no brackets (G1), dry skulls with metal brackets (G2), dry skulls with ceramic brackets with metal slot (G3) and dry skulls with pure ceramic brackets (G4). Invivo5 by Anatomage was used to assess the cortical bone density. Maxillary and mandibular left and right central incisor, canine and first molar were selected to assess the bone density at the following sites; buccal cervical margin, buccal middle, buccal root apex, palatal cervical margin, palatal middle and palatal root apex. Dependent one-way analysis of variance with Tukey post-hoc analysis was used to compare the four groups. Student t test was to compare the small and large voxel scans within each group. 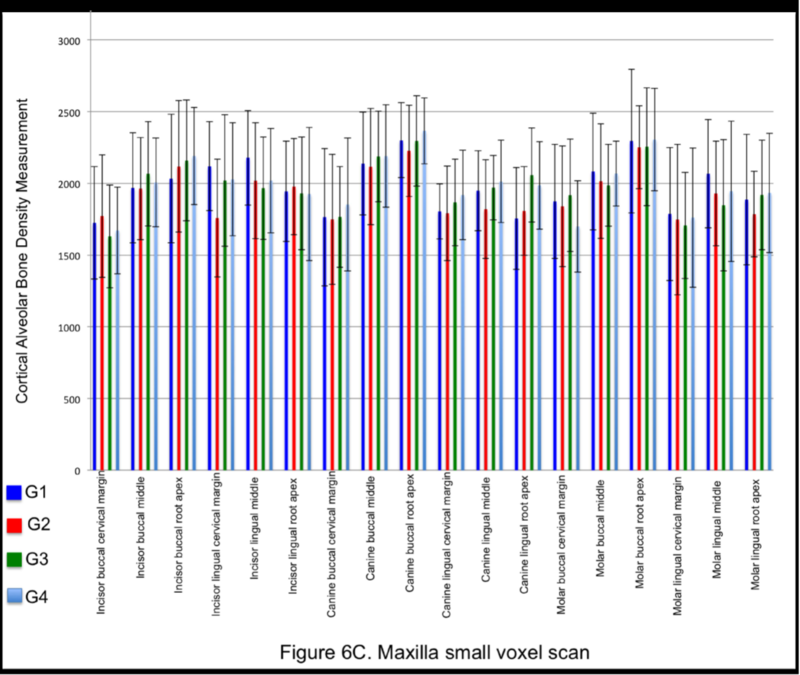 Results: Significant differences were observed for most sites between small and large voxel scans. However, no significant difference was observed between dry skulls without any brackets and dry skulls bonded with different bracket systems for density assessment of the bone of the alveolar process at any site. Conclusions: Presence of orthodontic brackets did not influence the assessment of the density of the cortical bone of the alveolar process. Bone is a dynamic structure that perceives and adapts to mechanical forces through bone formation and resorption via modeling and remodeling. Bone mineral density reflects the status of the underlying biological activity. In the dentoalveolar region this may be under the influence of general 1-3 factors such as age, underlying systemic disease, medication and local factors such as presence or absence of teeth 4 , occlusal loading 5 and orthodontic tooth movement. 6-8 Assessment of density of the bone of the alveolar process and three-dimensional localization of dentoalveolar structures is performed using cone-beam computed tomography (CBCT) radiographs. 9 CBCT is an indirect method to measure mineral density distribution based on the X-ray attenuation coefficient of minerals in bone tissue. While remaining an accurate tool for three-dimensional imaging, artifacts affect the image quality rendered by CBCT’s and thereby compromise bone density analysis. These artifacts 10 could be categorized into: (a) physics-based, which result from the image acquisition process; (b) patient-based, caused by factors such as patient movement or presence of metallic objects in/on the patient; (c) scanner-based, resulting from imperfections in scanner function; and (d) helical and multi-section artifacts, produced during the image reconstruction process. Amongst the sources for artifacts, presence of metallic objects is generally reported as the most common and severe factor causing streaking artifacts. 11,12 Because metallic structures have a high atomic number, they absorb mostly lower energy photons and produce dark bands and streaks in the image. This phenomenon is known as beam hardening. In addition, the image quality of CBCT scans may also be influenced by the field of view (FOV), scan time, tube voltage, amperage and voxel size. 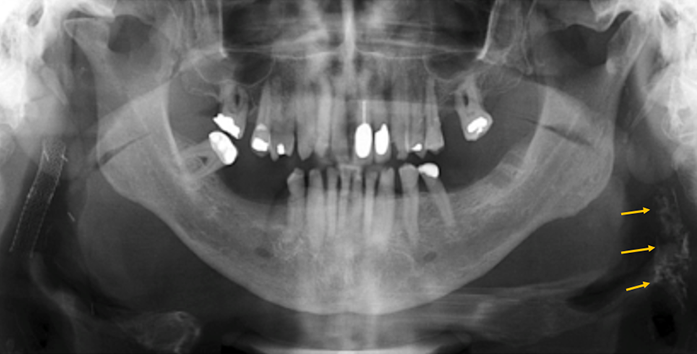 13 Over the past few years CBCT has become an important diagnostic tool in orthodontics for various qualitative outcomes such as localization of impacted teeth, bone graft evaluation in cleft sites, temporomandibular joint assessment, placement of temporary anchorage devices, Class II correction and impact of maxillary expansion on nasomaxillary structures. 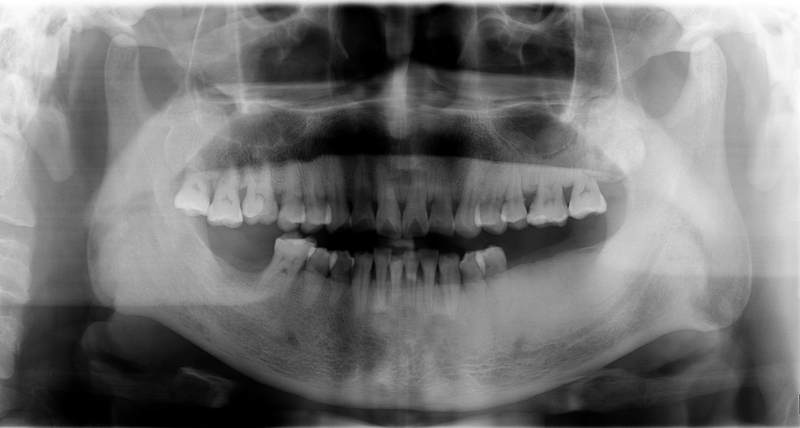 9 Recently there has been an increase in assessment of quantitative outcomes, particularly of the density of bone of the alveolar process during orthodontic therapy. 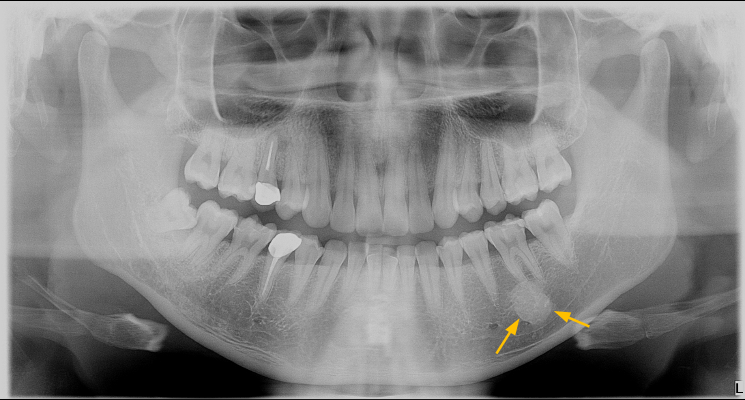 6-8,14-16 However these studies have orthodontic appliances during the follow up CBCT. The presence of metallic structures during acquisition of the scan could potentially affect the quality of the scan being rendered which in turn could affect assessment of the underlying bone density. 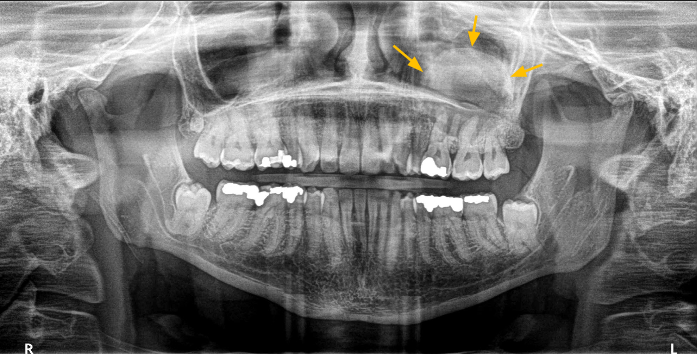 While removal of orthodontic appliances for the CBCT scan may be an option, the viability of the option would seem questionable. 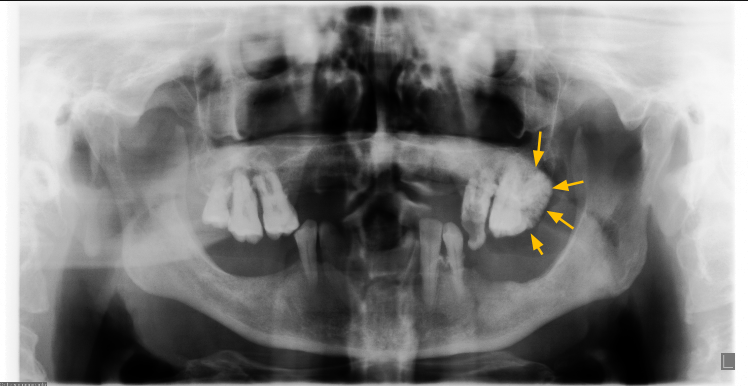 Presence of orthodontic brackets may influence evaluation of the underlying bone of the alveolar process density due to streaking created by the presence of metal. There seems to no information available on this matter. 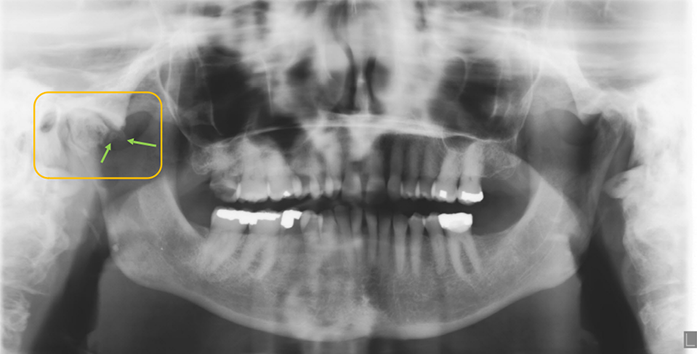 Thus, the aim of the study is to evaluate the influence of different orthodontic brackets on alveolar bone density in dry skulls using small and large voxel sized scans. For calculating the sample size, two dry skulls were scanned and the mean alveolar cortical CT density number calculated. Sample size calculation was performed based on the mean value of 1750 units in the dentoalveolar region (range 1000-2500 units) with an effect size of 100 units and ability to assess a 12.5% difference between the groups. The required sample size was calculated to be 10 per group for an alpha of 0.05 and the power of the study being 80 percent. 10 fully dentate dry human skulls were selected from the archives of University of xxxxxx. All skulls had full dentition with no metal restorations. Metallic springs and screws on the skulls were removed to prevent artifacts caused by metallic scatter during imaging.10-15mm of acrylic was applied to each jaw to replicate the soft tissue density of human cheek. 17 Using 360 degrees rotational acquisition large voxel scans at a resolution of 0.4 millimeters and small voxel scans at 0.2millimeters resolution were obtained for dry skulls with no brackets (G1), dry skulls with metal brackets (G2), dry skulls with ceramic brackets with metal slot (G3) and dry skulls with pure ceramic brackets (G4). The same 10 skulls were used in all four groups to ensure that the underlying bone density being assessed was same in all four groups and the difference in assessment of bone density was associated with the different bracket systems. All brackets in all three systems were 0.022-inch slot. The brackets were bonded from second premolar to second premolar in both the maxillary and mandibular arches. To replicate a clinical scenario, bondable single slot molar tubes were bonded on the first molars. A Boone’s gauge was used to assist in the vertical height placement of the brackets. The brackets were placed at the following height from incisal edge for each tooth; 3.5mm for molar, 4mm for premolars, 4.5mm for canines, 3.5mm for lateral incisors and 4mm for the central incisor. 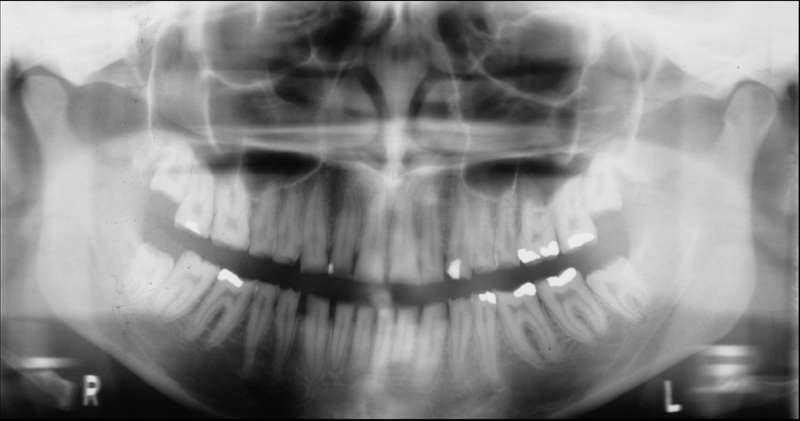 All scans were taken using the J Morita 3D Accuitomo 170 CBCT scanner. The skull was positioned such that the orientation of the skull was aligned to the Frankfort horizontal plane and was in the center of the field of view standardized by laser cross hairs (Figure 1). The scans were obtained at 80Kvp and 5 mA with a focal spot size of 0.5 mm. The image acquisition time was 17.5 seconds. Following image acquisition each scan was imported into invivo5 by Anatomage Inc, San Jose CA. The maxillary and mandibular right and left central incisors, canines and first molars were selected as the target teeth to assess density of the bone of the alveolar process. Values obtained from the left and right teeth were combined. Since 10 fully dentate skulls were used, the sample for each region being analyzed was twenty. 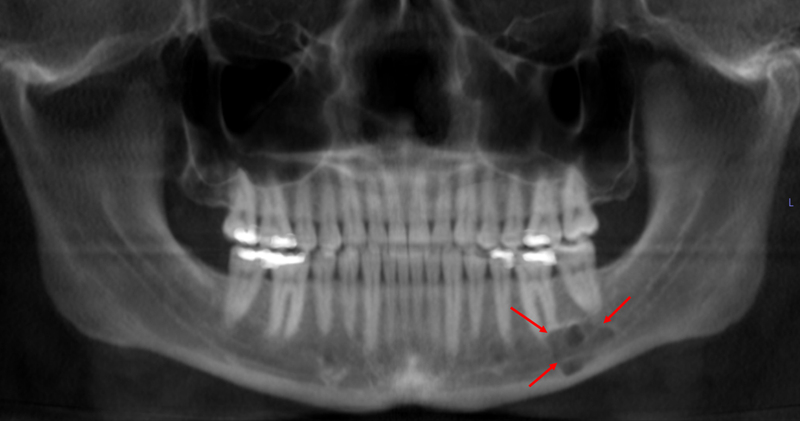 For each target tooth, the axial view was oriented to be parallel to the long axis of the tooth (Figure 2). 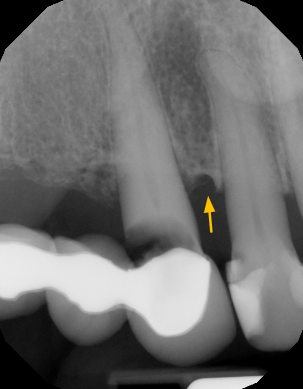 Following that in the sagittal view, a line was drawn along the long axis of the tooth from the incisal edge to root apex. Perpendicular to this, three lines were constructed from the tooth to the cortical bone at the alveolar crest, root apex and half the distance from root apex to alveolar crest (Figures 3,4). The measurements for cortical bone density were made at the following sites; buccal cervical margin, buccal middle, buccal root apex, lingual cervical margin, lingual middle and lingual root apex. Furthermore, to assess the volume of metal present in each metallic bracket we used the water displacement method. Each metal bracket was immersed in a 1ml syringe containing 0.2ml volume of water. After immersion, the volume displacement of water was recorded. The volume displacement was tested with immersion of one, two and three brackets (Figure 5). Care was taken to ensure that the lower meniscus was recorded while assessing the change in water level. This change was assessed to be the volume of the bracket (Table 1). This method was performed for the metal brackets only and not other bracket systems. All statistical analyses were performed using the SPSS software package (version 22.0, SPSS Inc, Chicago, Ill). Data were examined to ensure that the assumptions for normality of distribution and homogeneity of variance for planned parametric statistical tests were satisfied. Dependent one-way analysis of variance (ANOVA) with Tukey HSD post hoc analysis was used for comparison between the four groups. To adjust for multiple testing of various parameters within the same sample the post hoc confidence level was adjusted to be significant at a P value of 0.0083. Paired student t test was used to compare the bone density values between the small and large voxel scans within each group. To adjust for multiple testing the confidence level was adjusted to be significant at a P value of 0.001. To determine intra-examiner reliability, two skulls were randomly selected and all measurements were reevaluated after a four-week interval by the same examiner. Reliability analysis was performed using the Cronbach's alpha mean, which indicated good reliability as the ICC Cronbach’s alpha was found to be .78 (range .71 to .842). Tables 2,3 and figure 6 depict the descriptive statistics for the large and small voxel scans for all sites described respectively. Table 4 depicts the inter group comparisons between the four groups for each measured site. In the large field of view scan no significant difference for cortical bone density evaluation was observed at any of the sites that were measured. For the small field of view only the maxillary incisor palatal cervical margin, maxillary canine palatal root apex and mandibular incisor palatal middle were statistically significant. However, with the post hoc analysis being set at P ≤ 0.0083, none of the inter group comparison between the four groups led to any significant differences. Table 5 shows the comparison between the small and large voxel scans within each group. Statistically significant differences were observed for most of the sites that were assessed. CBCT’s have been used in qualitative assessment of alveolar crestal bone. 18,19 Assessing the accuracy of bone assessment using CBCT patcas etal 19 reported that while CBCT are accurate to assess bone coverage there is a risk of overestimating fenestrations and dehiscences. Recently there has been an increase in quantitative assessment of density of the bone of the alveolar process during various orthodontic treatment modalities. 6-8,14-16 Whether the presence of different orthodontic bracket systems influences the assessment of alveolar bone density largely remains unknown. This study aimed to answer this particular question. In our study we kept the scan machine, scan time, kvp, mA and image reconstruction process constant for all scans. Thus, the only variable between the groups was either no brackets or different bracket systems being bonded to the same skulls. We did not observe any significant difference between the dry skull and dry skull bonded with different bracket systems for assessment of density of the bone of the alveolar process at any site. Despite the presence of metal or ceramic brackets with a metal slot, it did not influence the assessment of cortical bone density at any particular site. This was contrary to our hypothesis and may be associated with two reasons. One reason could be that the amount of metal present in orthodontic brackets may not be sufficiently high enough to influence assessment of bone density. Using volumetric method we calculated the volume of metal present in each metallic orthodontic bracket (Table 1). Perhaps presence of minimal volume of metal interspersed at 7millimeter inter-bracket distance (average inter-bracket distance) along with the site of assessment of bone density being a few millimeters away did not lead to significant difference in bone density evaluation. However, further research would be required to assess as to the presence of how much metal begins to influence assessment of alveolar bone density. Perhaps patient movement during image acquisition maybe a more significant factor while assessing bone density using CBCT’s than presence of small metallic objects. The other reason may be with the CT number based assessment of bone density method in the dentoalveolar region. Traditionally Hounsfield units (HU) from CT scans have been derived to assess density of different tissues based on grey scale values obtained. 20 Similar CT numbers can be obtained from CBCT scans. These numbers have been found to have a linear correlation with HU and can be used to differentiate between tissues. 11 The use of HU to evaluate bone mineral density and quantify relative changes in alveolar bone has been reported in the dental literature. 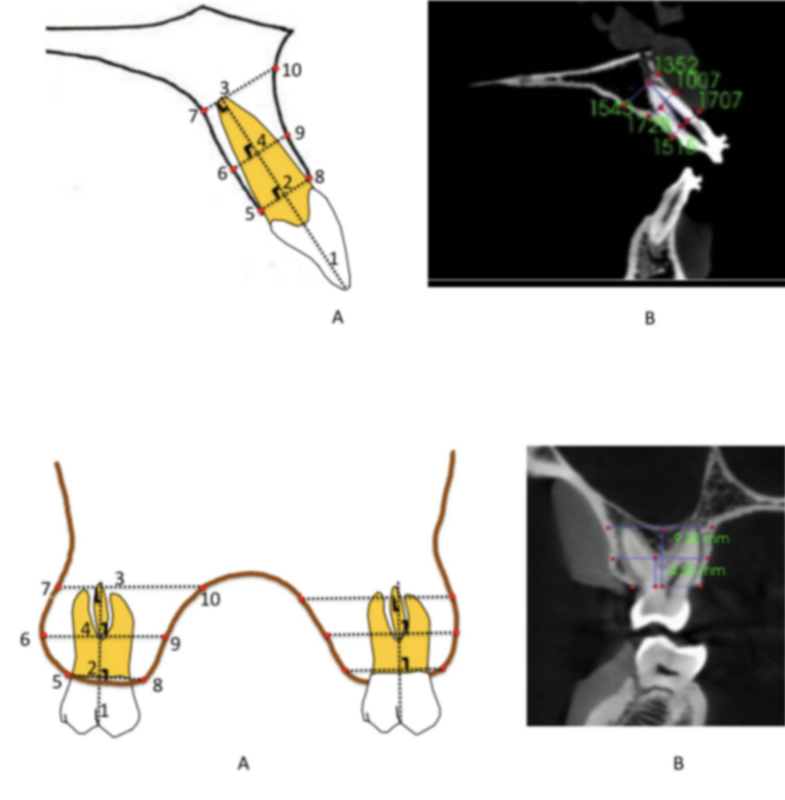 6-8,14-16 However, the challenge of using HU’s in the dentoalveolar region has been raised by some 21 stating that the assigned HU’s to voxels from CBCT’s are relative and thus may be influenced by surrounding tissues. 22 Furthermore the HU scale varies between different CBCT machines and image reconstruction software’s making comparisons challenging. 23 Other studies suggest that reliable HU’s can be obtained from serial CBCT’s using the same machine with identical scan settings. 6-8 However a direct comparison with other studies was challenging for us due to different CBCT machines and processing software being used. It is known that FOV and voxel size can affect the quality of the scan being rendered. Large FOV’s generally provide less sharp image reconstruction because of greater beam angulation and reduced contrast-to-noise ratio. 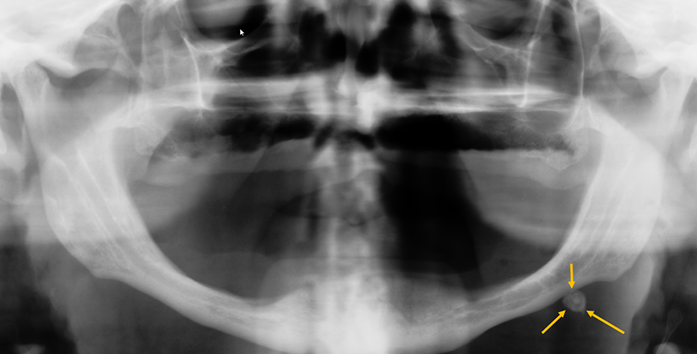 19 We kept the FOV constant to a small size since assessment of bone density is usually carried out on small FOV’s. Voxel size may influence the noise produced in an image, the smaller the voxel size the greater the noise, but higher the spatial resolution. 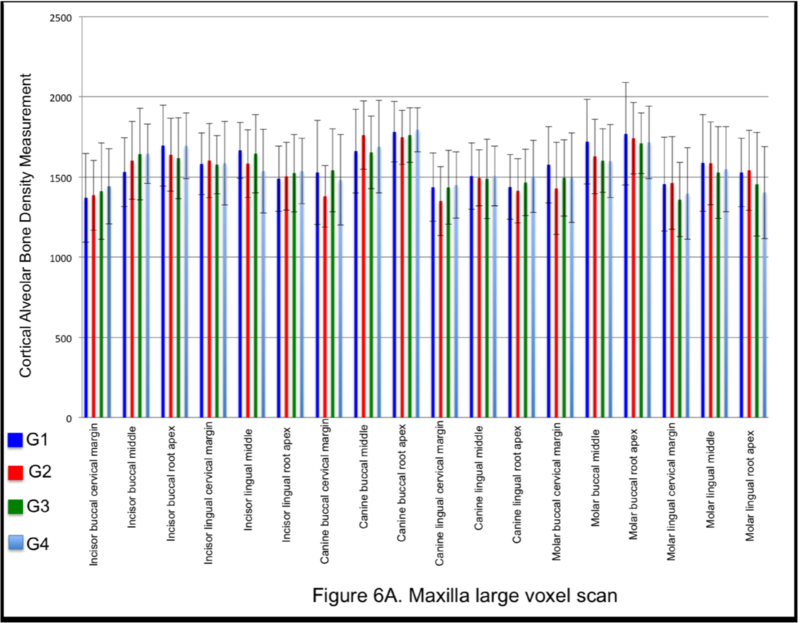 24 Evaluating the influence of voxel size on assessment of alveolar bone density we found that there was a significant difference for most parameters when comparing large to small voxel scans. This study is subject to several strengths and limitations. No study has attempted to assess the influence of different orthodontic brackets systems on the quantitative assessment of alveolar bone density. We ensured that the CBCT exposure parameters and post processing method were kept exactly similar for all four groups, ensuring that the only variable being tested was the different bracket systems. Absence of soft tissues has been reported by some 25 to be a limitation because soft tissue changes the absorption and increases scatter radiation thereby influencing the diagnostic accuracy of images. However, use of acrylic has been shown to successfully simulate soft tissue cheek density. 17 Results should be interpreted with caution due to the presence of dried fixed bone. Use of human patients for the study would be impractical to design as it would result in variability amongst patients being assessed with different bracket systems or radiation overexposure if the same patient was bonded multiple times with the bracket systems. Thus CT numbers from CBCT scans with any bracket system can be used to assess the quality of bone and/or changes due to tooth movement. The most valuable clinical value of this study is that the data from this study shows that CBCT generated pixel intensity values can be used to assess changes in bone density. With metallic brackets being the most commonly used bracket material, the concern of scatter and metallic streak can alter density values. This is especially true in cases where the changes in bone density are being monitored, like in syndromic patients or in adult orthodontic patient groups .This simple and practical method can help clinicians monitor density changes over time while proactively providing the patient with the desired benefits or orthodontic treatment. No significant difference was observed for assessment of alveolar bone density measurement between the dry skull and different bracket systems for any buccal or palatal site in either the maxilla or mandible. Significant differences were observed for most parameters assessed between small and large voxel scans. Table 1. Volume of metal in each bracket using water displacement method. Table 2. Descriptive statistics for the large voxel scan. Table 3. Descriptive statistics for the small voxel scan. Table 4. 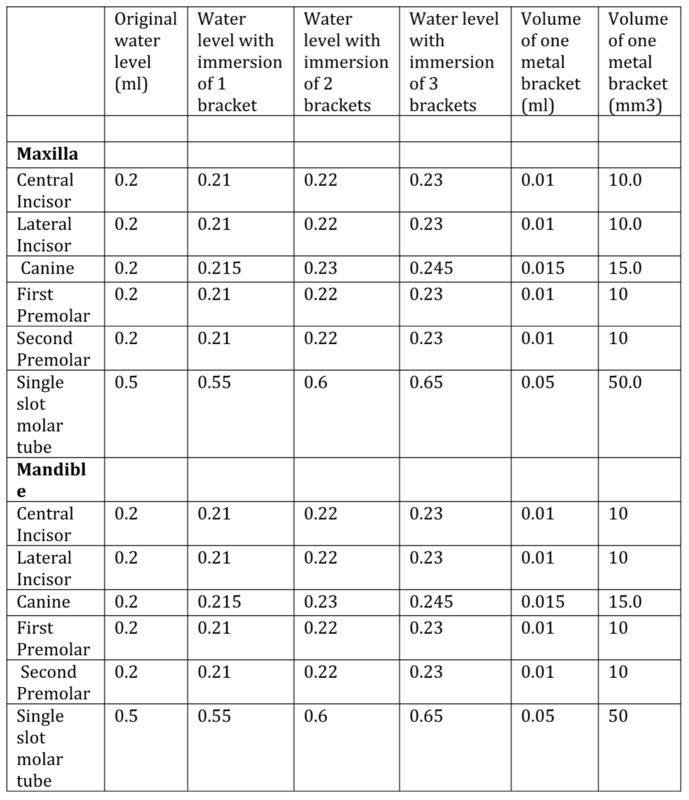 Inter group comparison for cortical bone measurement for each assessed site. Table 5. 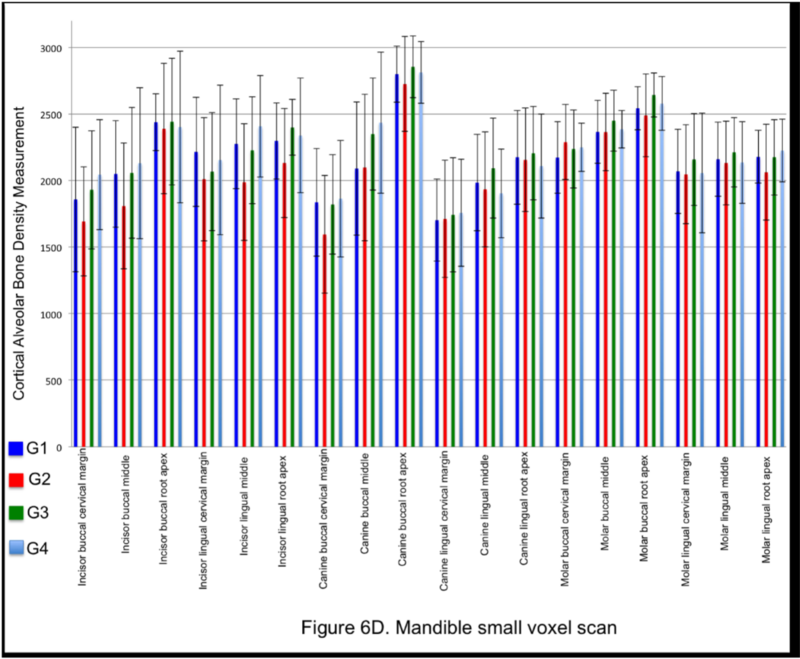 Comparison between large and small voxel scans to assess differences within each group using paired sample T test. Figure 1. Orientation of skull A – Dry skull with no brackets; B- dry skull with metal brackets; C- Dry skull with ceramic bracket with metal slot; D- dry skull with pure ceramic brackets. Figures 3 and 4. (A) Reference planes and variables; (1) Long axis of central incisor, canine or molar; (2) Perpendicular line to long axis of tooth passing through alveolar crest, (3) Perpendicular line to long axis of tooth passing through root apex, (4) perpendicular line to long axis of tooth passing through half the distance from root apex to alveolar crest; (5) buccal cervical margin; (6) buccal middle; (7) buccal root apex; (8) palatal cervical margin; (9) palatal middle; (10) palatal root apex. (B) clinical example of evaluation of cortical bone density. Figure 5. Water displacement method to assess volume of metal bracket. (A) – 0.2ml of water; (B)- insertion of one metal bracket in water; (C)- insertion of three metal brackets in water. Figure 6. 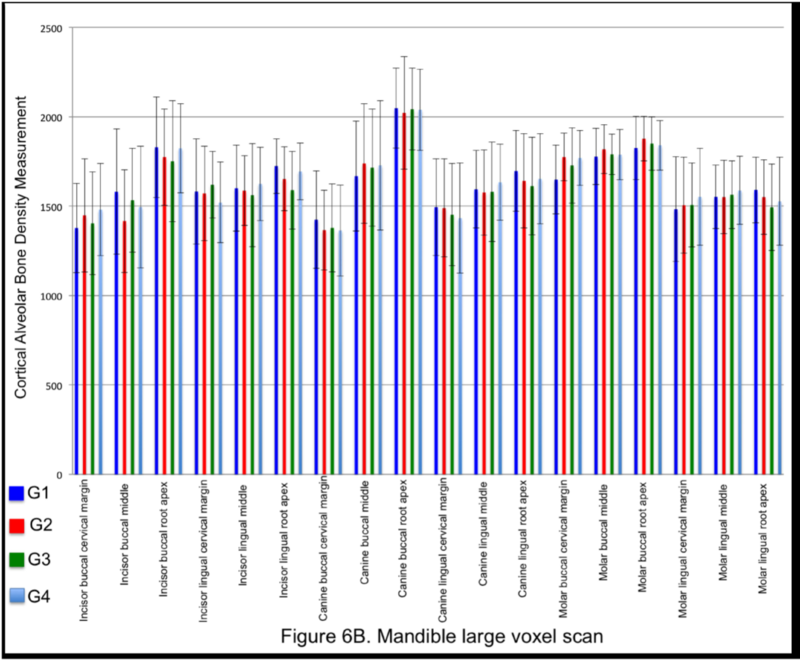 Mean and standard deviation of alveolar cortical bone density for (A) maxilla large voxel scan; (B) mandible large voxel scan; (C) maxilla small voxel scan and (D) mandible large voxel scan. Streckfus CF, Johnson RB, Nick T, Tsao A, Tucci, M. Comparison of alveolar bone loss, alveolar bone density and second metacarpal bone density, salivary and gingival crevicular fluid interleukin-6 concentrations in healthy premenopausal and postmenopausal women on estrogen therapy. J Gerontol A Biol Sci Med Sci. 1997;52:343-351. Southard KA, Southard TE, Schlechte JA, Meis PA. The relationship between the density of the alveolar processes and that of post-cranial bone. J Dent Res. 2000;79:964-969. El-Shinnawi UM, El-Tantawy SI. The effect of alendronate sodium on alveolar bone loss in periodontitis (clinical trial). J Int Acad Periodontol. 2003;5:5-10. Taguchi A, Suei Y, Ohtsuka M, Otani K, Tanimoto K, Hollender LG. Relationship between bone mineral density and tooth loss in elderly Japanese women. Dentomaxillofac Radiol. 1999;28:219-223. Janovic A, Milovanovic P, Saveljic I, Nikolic D, Hahn M, Rakocevic Z, Filipovic N, Amling M, Busse B, Djuric M. Microstructural properties of the mid-facial bones in relation to the distribution of occlusal loading. Bone. 2014;68:108-114. Chang HW, Huang HL, Yu JH, Hsu JT, Li YF, Wu YF. 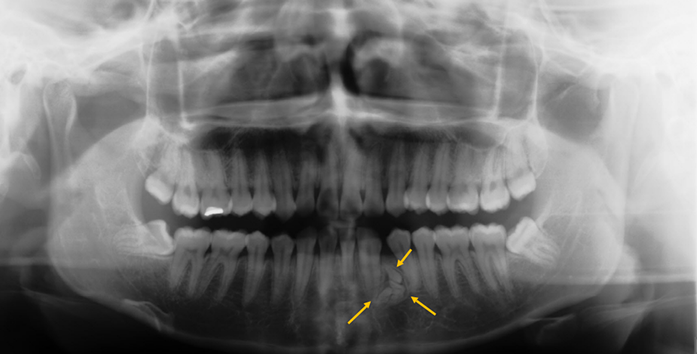 Effects of orthodontic tooth movement on alveolar bone density. Clin Oral Investig. 2012;16:679-688. Hsu JT, Chang HW, Huang HL, Yu JH, Li YF, Tu MG. 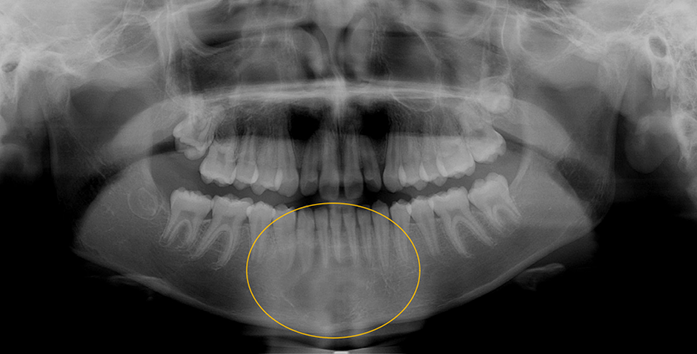 Bone density changes around teeth during orthodontic treatment. Clin Oral Investi. 2011;15:511-519. Jiang F, Liu SSY, Xia Z, Li S, Chen J, Kula KS, Eckert G. Hounsfield unit change in root and alveolar bone during canine retraction. Am J Orthod Dentofacial Orthop. 2015;147:445-453. Kapila S, Conley RS, Harrell Jr WE. The current status of cone beam computed tomography imaging in orthodontics. Dentomaxillofac Radiol. 2011;40:24–34. 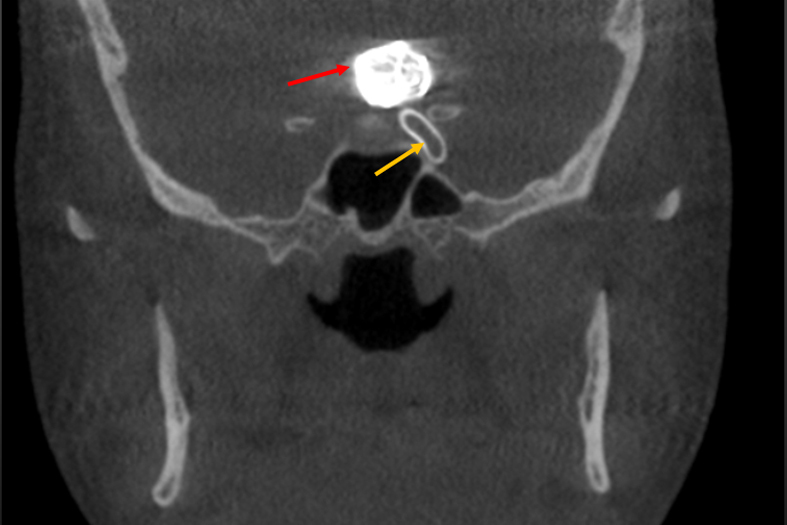 Barrett JF, Keat N. Artifacts in CT: recognition and avoidance. Radiographic. 2004;24:1679-1691. Oliveira ML, Tosoni GM, Lindsey DH, Mendoza K, Tetradis S, Mallya SM. Influence of anatomical location on CT numbers in cone beam computed tomography. Oral Surg Oral Med Oral Pathol Oral Radiol. 2013;115:558–564. Schulze R, Heil U, Groβ D, Bruellmann DD, Dranischnikow E, Schwanecke U, Schoemer E. Artifacts in CBCT: a review. Dentomaxillofac Radiol. 2011;40:265–273. Kwong JC, Palomo JM, Landers MA, Figueroa A, Hans MG. Image quality produced by different cone-beam computed tomography settings. Am J Orthod Dentofacial Orthop. 2008;133:317–327. Ahn HW, Moon SC, Baek SH. Morphometric evaluation of changes in the alveolar bone and roots of the maxillary anterior teeth before and after en masse retraction using cone-beam computed tomography. Angle Orthod. 2013;83:212-221. Thongudomporn U, Charoemratrote C, Jearapongpakorn S. Changes of anterior maxillary alveolar bone thickness following incisor proclination and extrusion. Angle Orthod. 2014;85:549-554. Picanço PR, Valarelli FP, Cançado RH, Freitas KM, Picanço GV. Comparison of the changes of alveolar bone thickness in maxillary incisor area in extraction and non- extraction cases: computerized tomography evaluation. Dental Press J Orthod. 2013;18:91-98. Schropp L. Alyass NS, Wenzel A, Stavropoulos A. Validity of wax and acrylic as soft- tissue simulation materials used in in vitro radiographic studies. Dentomaxillofac Radiol. 2012;41:686–690. Patcas R, Müller L, Ullrich O, Peltomäki T. Accuracy of cone-beam computed tomography at different resolutions assessed on the bony covering of the mandibular anterior teeth. Am J Orthod Dentofacial Orthop. 2012;141:41-50. Cann CE. Quantitative CT for determination of bone mineral density: a review. Radiology. 1988;166:509-522. Pauwels R, Jacobs R, Singer SR, Mupparapu M. CBCT-based bone quality assessment: are Hounsfield units applicable? Dentomaxillofac Radiol. 2015;44:20140238. Araki K, Okano T. The effect of surrounding conditions on pixel value of cone beam computed tomography. Clin Oral Implants Res. 2013;24:862-865. Norton MR, Gamble C. Bone classification: an objective scale of bone density using the computerized tomography scan. Clin Oral Implants Res. 2001;12:79-84. Al-Rawi B, Hassan B, Vandenberge B, Jacobs R. Accuracy assessment of three- dimensional surface reconstructions of teeth from cone beam computed tomography scans. J Oral Rehabil. 2010;37:352–358. Sun Z, Smith T, Kortam S, Kim DG, Tee BC, Fields H.Effect of bone thickness on alveolar bone-height measurements from cone-beam computed tomography images. Am J Orthod Dentofacial Orthop. 2011;139:e117-127. (A) Reference planes and variables; (1) Long axis of central incisor, canine or molar; (2) Perpendicular line to long axis of tooth passing through alveolar crest, (3) Perpendicular line to long axis of tooth passing through root apex, (4) perpendicular line to long axis of tooth passing through half the distance from root apex to alveolar crest; (5) buccal cervical margin; (6) buccal middle; (7) buccal root apex; (8) palatal cervical margin; (9) palatal middle; (10) palatal root apex. (B) clinical example of evaluation of cortical bone density. Water displacement method to assess volume of metal bracket. 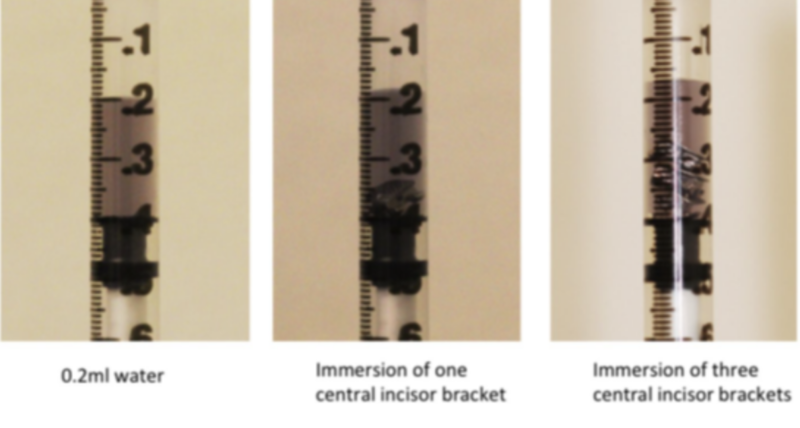 (A) – 0.2ml of water; (B)- insertion of one metal bracket in water; (C)- insertion of three metal brackets in water. Mean and standard deviation of alveolar cortical bone density for maxilla small voxel scan and (D) mandible large voxel scan. Mean and standard deviation of alveolar cortical bone density for mandible large voxel scan. Figure 6C. Mean and standard deviation of alveolar cortical bone density for maxilla small voxel scan and (D) mandible large voxel scan. Figure 6D. Mean and standard deviation of alveolar cortical bone density for mandible large voxel scan.